Authors' note: This column is based on a paper written with Maria-Ángeles de Frutos​. The growing costs of healthcare and pharmaceutical treatments make newspaper headlines all too often. Governments strive to cut costs wherever they can, sometimes at the expense of quality standards. Stimulating the market penetration of generic drugs has been an instrument of choice to fight ballooning drug prices. In this column, we explore why this particular cost-containing strategy has only met with limited success. Encouraging the use of generics – sometimes through binding constraints – has gained strong traction at least since the 1984 Hatch-Waxman Act. The idea is very simple: when a patent expires, make it easy for other firms to produce a copy of the original drug, at a fraction of the cost. This reinforces price competition and should limit Big Pharma’s ability to maintain high prices. According to some measures, such as the share of generics in the sales of molecules that have lost patent protection, this policy has been a great success (see Ellison et al. 1997, Berndt 2002, or Grabowski et al. 2014, who show that the market share of an originator drug typically drops below 20% after one year). Furthermore, the number of molecules facing generic competition has also soared since the early 2000s (Aitken et al. 2013). And yet, spending on drugs keeps growing. For instance, Conti et al. (2015) report that “total US prescription drug spending rose 13% in 2014 [alone],” with increases reaching 31% in some market segments, e.g. for cancer drugs. How have firms managed to sustain such high prices despite decades of policies stimulating generic competition? Beyond the factors already identified in the literature (e.g. innovation or demographic change), our recent paper uncovers a baffling piece of evidence (Castanheira et al. 2017). While generic competition effectively puts a dent in the market share of the originator molecule, it is also associated, on average, with a drop in the use of the genericised molecule. In other words, when some branded drug, say Prozac, loses its patent protection, it faces intense competition from numerous producers selling its generic equivalent (e.g. Teva fluoxetine or Mylan fluoxetine), and competition works in the sense that Prozac loses market shares to these generics. However, competition fails at large because fluoxetine will sell less, to the benefit of other, still branded, anti-depressants (e.g. sertraline, sold under the brand name Zoloft). Our results exploit a dataset that covers essentially all the episodes of generic entry in the US during the decade starting in 1994. We track prices, sales, and promotion intensity on a quarterly basis. Figure 1 combines 95 episodes of generic entry by grouping each of these episodes at ‘date 0’ and identifies the quarterly evolutions of prices and volume sales of these molecules before and after generic entry. It emerges that, despite a price drop of about 45% after 12 quarters, the total quantity sold of the now cheaper molecule – i.e. the originator drug plus its generic bio-equivalents – falls, on average, by about 25% (the volume market share drop is even more marked, as sales grew over our sample period). Where does such a reverse competition effect come from? To understand this effect, it is important to highlight two channels of competition on the market for drugs. First, there are obviously prices­. We find a price elasticity for generics as high as 9, making the market for the molecule very close to perfect competition (Ellison et al. 1997 had already identified high elasticities for intra-molecular competition). Second, there is promotion. For Big Pharma, promotion reaches a staggering 15% of the value of sales (Danzon and Nicholson 2012). The firms’ strategy – trying to sway demand to favour their most profitable lines of business – has been widely documented (e.g. Caves et al. 1991, Kremer et al. 2016). The mechanism we identify is the relationship between price competition and the amounts invested to promote a molecule. Firms most intensely promote molecules that yield the highest profits. When competition is symmetric, this generally favours the highest quality drugs, which is a desirable feature from the patients’ perspective. Yet, when competition is asymmetric – for example, because one molecule faces generic competition while the other remains patent protected – firms stop promoting their genericised molecule, thus shifting demand away from the cheaper products. Figure 2 depicts this strategic shift very clearly. Firms already start decreasing their promotion 12 quarters before patent expiration, with a marked acceleration right after ‘date 0’. 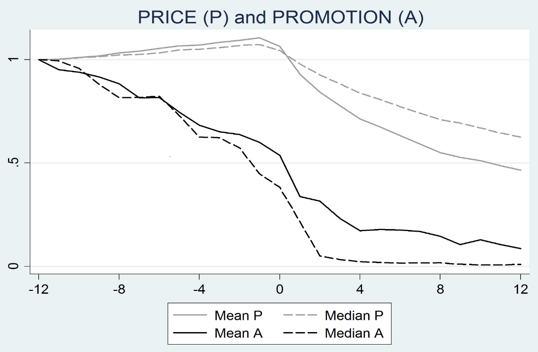 Whether the pro-competition drop in prices or the reverse competition drop in promotion dominates is an important question. Our theoretical model suggests that, rather counter-intuitively, the reverse competition effect is more likely to dominate when two drugs (call them A and B) are closer substitutes. The reason is that the more substitutable the two drugs are, the more aggressively A and B compete before the entry of the generic. This translates into initially lower prices and more promotion. Under these circumstances, generic entry has a comparatively small impact on prices – the decrease in promotion dominates. Theory also informs us on the expected effects of demand elasticity and market size. 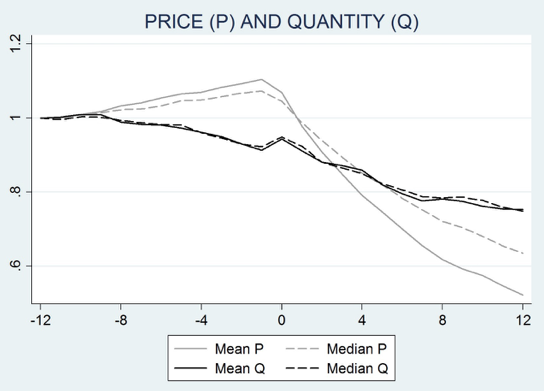 First, a lower price elasticity of demand (e.g. due to higher insurance coverage) is found to increase the likelihood that the reverse competition effect will dominate. Second, a similar effect applies to market size – generic competition will dampen the consumption of the cheaper molecule in large markets because other brands will seize this opportunity to increase their promotion intensity. We test these predictions econometrically and find strong support for them. Generic entry alone causes on average a 12% increase in the market share of the competing molecules that remain on patent. This reverse competition effect is reduced by about 4% in markets with higher differentiation – i.e. when different methods of treatments co-exist. The gains of the still-branded molecules are further reduced by 3% in the more price-sensitive segment of hospitals, as compared to pharmacies. Finally, the market share increase is reduced by another 7% in ‘small’ markets. These results usefully complement those reported in De Frutos et al. (2013), who show that firms’ investment in promotion makes patients more loyal to their brand. Here, we find that firms can also modify this loyalty away from molecules that cease to be profitable. A common belief among economists is that forces that stimulate competition must improve market outcomes. Abstracting from situations in which market failures are obvious (e.g. significant information asymmetries), economic theory has only identified a few exceptions where increasing competition fails to improve market efficiency and welfare. We contend, instead, that the link from competitiveness to allocative efficiency is weaker than suggested by that common belief. To attract customers, firms do not only cut prices. They also use non-price instruments, such as advertising and investment in brand management. The mere presence of these instruments affects – or even reverses – the way competitive shocks alter market outcomes. Indeed, intense competitive pressure cripples firms' ability to invest in non-price instruments. And this is not merely a theoretical curiosity. These predictions are confirmed in the case of the trillion-dollar pharmaceutical industry. We show that the market generally fails to put effective pressure on the drugs that remain patent protected. Going one step further, the model allows us to infer some welfare implications. A sufficient condition for patient (consumer) surplus to increase after generic entry is that the market share of molecules remaining on patent should decrease in equilibrium. As this condition is rarely met in practice, asymmetric competition shocks often end up hurting patients. The model also allows us to assess when the change in market shares produced by generic entry brings market allocation closer to the first best. The answer is never, and a ban on promotion would not solve the problem. In view of the outcome associated with unfettered market forces, public intervention to actively promote generic use seems warranted. In Europe, this is primarily a task for social security systems. If the scope of government intervention is limited, then it falls to private buyers to ensure that patients are directed to or maintained on cheaper treatments when they become available. In the US, third-party payers have started providing strong incentives so that patients stop switching to other patented drugs once a generic version of their treatment comes to market. These developments appear to be an endogenous response to the strength of the reverse competition effect. In pharma, it would appear that price signals are not always sufficient to ensure efficient allocation. Berndt, E R (2002), "Pharmaceuticals in US Health Care: Determinants of Quantity and Price", Journal of Economic Perspectives 16(4), 45-66. Caves, R E, M D Whinston, and M A Hurwitz (1991), "Patent expiration, entry, and competition in the US Pharmaceutical Industry", Brookings papers on Economic Activity: Microeconomics, 1-23. De Frutos, M A, C Ornaghi, and G Siotis (2013), "Competition in the pharmaceutical industry: how do quality differences shape advertising strategies? ", Journal of Health Economics, 32, 268-285. Elison, S, I Cockburn, Z Griliches, and J Hausman (1997), "Characteristics of Demand for Pharmaceutical Products: An Exploration of Four Cephalosporins", RAND Journal of Economics, 28 (3), 426-446. Grabowski H, G Long, and R Mortimer (2014), "Recent trends in brand-name and generic drug competition", Journal of Medical Economics 17 (3):207-14. Director for Research of the Fonds National de la Recherche Scientifique, Professor of Economics at ECARES and CEPR Research Fellow. Associate Professor, Economics Department, Universidad Carlos III de Madrid; CEPR Research Fellow.